The 120B Series Industrial ScopeMeter® Test Tools include innovative functions designed to help technicians troubleshoot faster and get the answers they need to keep their systems up and running. 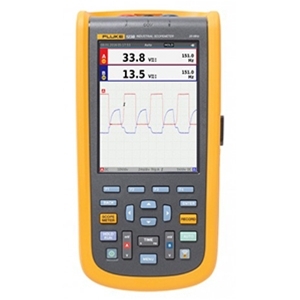 Display waveforms with Connect and View™ trigger and setup technology and automatically view related numerical measurements using Fluke™ IntellaSet technology all without making manual measurement adjustments. With Recorder Event Detect capabilities, elusive intermittent events are captured and logged for easy viewing and analysis. • Store instrument setups defined by a test sequence for routine maintenance or most often used test procedures.